Will coal ash end up in consumer products? 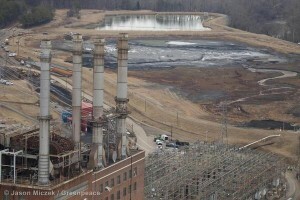 We’ve all been reading about the ugly environmental disaster unfolding in Eden at Duke Energy’s retired Dan River coal-burning plant. As of this writing, the coal ash pond pipe has been plugged, but not before dumping more than 80,000 tons of waste into the Dan River. You can read more about the risks of mixing coal ash (which contains lead, arsenic, mercury and selenium) into consumer products from the Healthy Building Network here. US EPA regulations will be released in December. Here we go again. Easing environmental policy will only create Love Canal over and over again. Doesn’t the GOP understand that they have to live in the world they create? I thought regressives were all about sustainability and recycling? GOP would only care if it landed on their doorstep. As long as someone made a profit all is good. After all, a little arsenic and mercury in your drinking water is good for you, right?